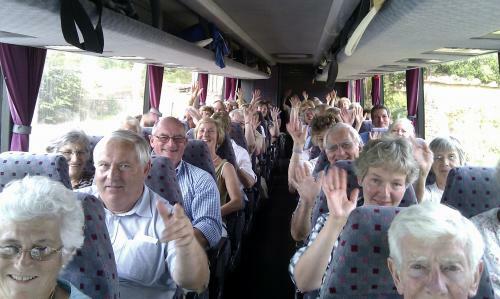 The Horticultural Society, members and friends, over 50 of us in all, enjoyed a fascinating trip to Highgrove Gardens. HRH The Prince of Wales has spent 30 years transforming the grounds of Highgrove through a mix of the traditional and the imaginative - his imagination and that of designers and gardeners. Who else for example could have received a gift of carved doors from India and then designed and had built a garden building to hang them? Our guide, Caroline brought out the detail of how the gardens have reached their present state and continue to develop. Cameras are not allowed in the gardens, for security reasons, so the photograph is of our happy band snapped shortly after departure. It is extraordinary how nature can thrive against the odds. Miss Ward used to live at 18 Chard Road. For decades she was an avid gardener. But her garden steadily fell into decline as she got older and she became unable to look after it. Since her death in December 2008 her former garden has vanished. After her house was sold in 2009 the garden was strimmed and hacked back leaving nothing behind above ground. That winter it looked a bit like The Somme. It then became a building site disappearing under mountains of rubble and all the other stuff that a major building project generates. Finally, in early 2011, much of the rubble was moved around and buried, and the site was levelled and graded before being left to its own devices. In the months since then a few tough garden plants have regenerated, but more noteworthy is the appearance of tens of thousands of new plants, growing up from long dormant seeds or from seeds brought in by chance and the wind. The emerging unplanned, un-designed, chaotic garden is nothing less than a paradise. It is a rich tapestry of exuberant colour, texture and movement. At the moment rafts of purple blowsy-flowered opium poppies stand to attention, heads and shoulders above the rest, with the occasional flamboyant overblown pink one dotted here and there. Wild flowers have joined the party, too, tall robust things I cannot name. Thistles are preparing to scatter their seeds, but I’m not complaining. The garden is abuzz, full of bees wading through the stamens in the cupped poppy flowers. Swallows and house martins skim and dip above it all picking insects out of the air. Although the garden has been filling and growing for months, each day I find it hard to believe my eyes. But it is real. It is early July and the poppies are in full cry, but I am already looking forward to the masses of brassy yellow sky-high sunflowers that will burst into flower in a month or so. There were sunflowers before but they have been ‘propagated’ unintentionally when the man with the digger graded the site and spread them about. Little did he realise he was helping create a garden to challenge the best that the RHS Show at Chelsea or Hampton Court can offer. 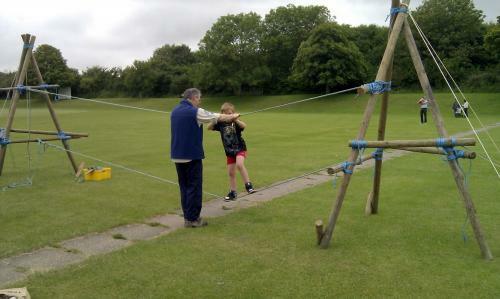 Well, OK, it was just over a footpath at the Memorial Playing Fields in Beaminster, but a challenge all the same if you've never crossed a rope bridge before. 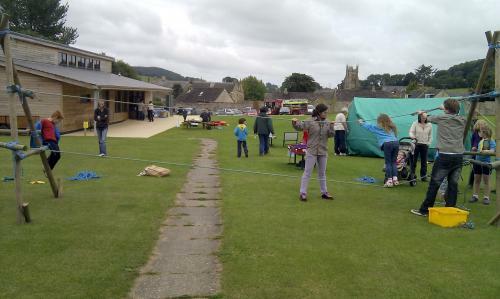 The 1st Beaminster Scout Group was running a taster session evening and amongst the parents bringing a few along to have a go were some from Drimpton. TUES 19th: FOLK NIGHT. Come along to play or listen, or both. The Village Hall Survey got just over a 50% response. Thank you for giving it some thought. The results will be considered along with the results of the 2008 Village Survey to decide a way forward for the Village Hall activities. We will keep you all informed about the outcome. 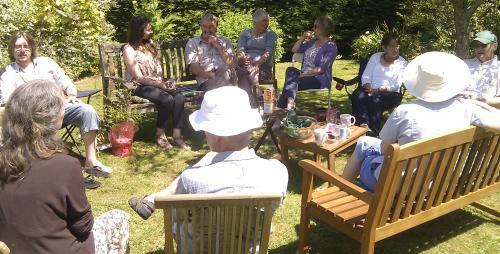 BBQ Lunch (bring your own meat) – Tea and Cakes at the end. - To object to the proposed diversion of Footpath 26 from Drimpton to Seaborough on the grounds that the Watery Lane section was unsuitable on safety grounds. - To object to the plan to erect a 30mtr wind turbine between Seaborough and Mosterton on the grounds of size, noise and position. In addition, the PC found it unacceptable that there had been little or no consultation with the interested parties prior to the planning application. Thanks to the members’ enthusiasm and superb leadership from Clair, Street Dance was a wonderful success. There was a great display of hidden talent on show. So much promise was evident that Clair has agreed to run a few more practices in August in order that the D&NYC Street Dance Team can display in the arena on Fun Day. remembered and celebrated in flowers. On Sunday 24th JULY at 6.30pm. All very welcome. Where there will be archery, steam train rides, 5-a-side football and skittles competitions, children’s sports, fair, stalls and lots more. The show will be upon us quicker than you think, especially if you have plants or produce you are hoping to have just right for the day. Most people who want a Schedule probably have one by now, but if you have missed out, Brian or Rosemary will happily get one to you. Please submit entry forms by the Wednesday before the show. This year, thanks to the Fun Day team, we shall have much more room for the show, because we'll also be using the marquee, so whatever the weather it should be a good day, for all ages. at their base at RAF Scampton AND £100 travel expenses. WOW ! ! ! ! Meet the amazing pilots and the skilled engineers who support them as they train for their famous summer display season. Listen to the display brief and then watch the display from the control tower. Have your photograph taken with the pilots with one of the aircraft in its famous livery. Be involved in the post-flight debriefing and have a light lunch with the pilots. Proceeds from FUN DAY support village organisations & activities. We love talking about books! The Netherhay Ladies’ Book Group has been meeting monthly for 4 years now to discuss what we have been reading and celebrate our love of books. Through our Group we have expanded our reading horizons and visited worlds we might not have ventured into otherwise. We have laughed and cried, or sometimes yawned, over the pages, and have had fiercely good-humoured differences of opinion as we continue to explore diverse tastes and common joys. 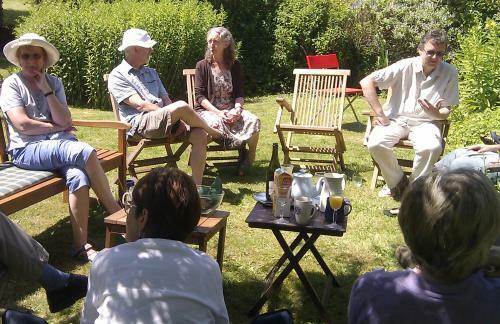 Our meetings are lively and sociable, and we have kept each other company not just through sharing literary adventures, but also through the ups and downs of our own lives, and so we discover connections via the page and with each other. The support and fun we share is enriching for us all. 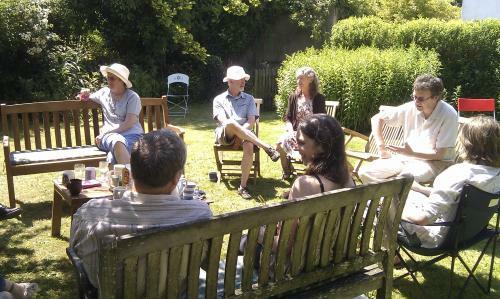 The inspiration behind this Archive project, Andrew Pastor, ends a decade and celebrates at his 60th Birthday Brunch with friends: Chris, Amanda, Tim and Kama (hosts), Bob, Rosemary, Mike, Hilary, Beryl, Ken, Kate & Brian. 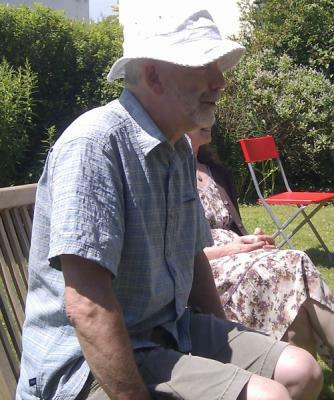 John even finished cutting the hay, in the neighbouring field, in time to leave us to enjoy the peace of Chris' & Amanda's garden. The Lone Ranger and Tonto - In Greenham!? 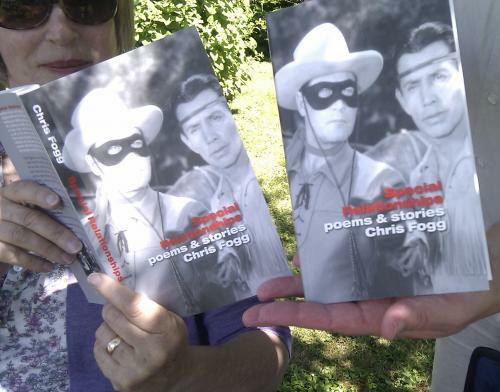 Greenham isn't all Cosy Pets and gardens rambling down to the stream; tucked modestly in a corner is local story-teller (amongst many other things) Chris Fogg. He didn't pose this, but I couldn't resist, as two of his friends held copies of his recently published book, grabbing a picture. Rainfall at Drimpton Cross during the month of June 2011 was 110.5 mm. or if preferred 4.39 inches. Comparative figures for 2010 were 14. mm or .56 ins. Both the residential trips (one for the Year 4s the other for Year 6s and some Year 5s) were a great success. The children thoroughly enjoyed all their activities and in the process made new friends with pupils from the other schools. These trips play an important part in helping the transition from primary to secondary school, which we’re heading fast towards. In May, our cricket team played admirably in the West Dorset Kwik cricket tournament held at Colfox. Our final position was third, winning 4 games and losing only once. Once again we have a busy half term ahead. Visits outside of school to enrich curriculum teaching are taking place – William Barnes class will be visiting the Lighthouse Theatre, Poole to watch the Bournemouth Symphony Orchestra concert – Heropes & Legends, Mary Anning class will be visiting the Sea Life Centre and Thomas Hardy class will be visiting Weymouth. In addition to this, various sporting activities will be taking place – the cluster schools Swimming Gala at Beaminster School, cycle training, Pyramid Athletics, Football tournament at Bridport FC, after-school archery club and of course our own Sports Day on 24th June..
We are also looking forward to participating in the Beaminster Festival this year. Our Year 5 pupils will be taking part in an interactive music workshop at Beaminster Church on the 28th June. Term finishes on Thursday 21st July for our summer holidays and we return on Wednesday 7th September. April was a very short month for us with Easter holidays taking up much of the month. However, we were able to celebrate the Royal Wedding of Prince William & Kate Middleton on the 29th April. The day before the wedding, we all had a ‘street party’ on the playing fields with lots of party food. It was a terrific way for the children to celebrate. Many children brought hats, which they had decorated or made themselves. Prizes were given to the best in each class. All the children and staff went home with a commemorative mug. The summer term is always a mixture of hard work and fun – SATS tests in early May, and trips and visits to lighten the mood. Our Year 6 pupils and some Year 5s set off very early (6.30am!!) on the first day back after Easter, on their residential trip. This year they have gone to an activity centre in Shropshire, with pupils from Greenford School. This annual trip for the Year 6s is an event, which is very much looked forward to and helps with friendship links before going onto Secondary school in September. Our Year 4 pupils set off for their residential trip on the 11th May for 3 days away. For many, if not most, this is the first time away from home and family but they are kept busy with exciting and interesting activities with their base being a terrific YHA castle at St Briavels. At the time of writing, our Year 6 pupils will be anticipating the start of SATS week on 9th May. They and their teacher Mrs Boakes have worked hard in preparation for these tests and we wish them the very best of luck. We break up for half term on 27th May, returning to school on Tuesday 6th June.